1. Don't require deposit upon the date of acceptance, because publisher embargoes are timed to begin on the date of publication, not the date of acceptance. 2. Don't require deposit of the author's final draft; wait for the publisher's version of record. 3. Don't require deposit at all: let us take care of it, after our embargo has elapsed: then you don't have to worry about figuring out the date of publication. 4. Please send us a justification for wanting to do otherwise. Now I find these four points so outrageous and presumptuous -- and so transparently self-interested, running roughshod over the interests of research, researchers, their institutions, their funders, and the tax-paying public -- that they don't need to be answered at all (and of course they need not and should not be heeded in any way). 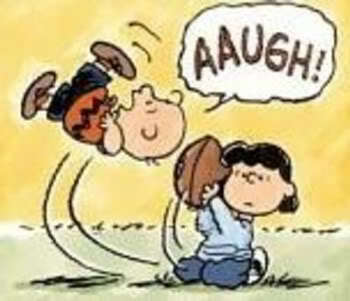 But past experience has shown that the research community (like Schultz's Charlie Brown and the annual football that Lucy always manages to pull out from under him every time) somehow always manages to fall for publisher FUD. The FUD is invariably formulated to appear as if the publishers are just trying to help, and make things simpler and easier for the research community. But what keeps being missed by the naive research community is that the complications and difficulties that the publishers' proposals to "help" with are invariably complications and difficulties that are being imposed by the publishers themselves, in the form of embargoes and restrictions! In the present case it's all about ensuring the one thing that is important to publishers about open access and open-access mandates: that publishers' embargoes on Green OA are faithfully obeyed (unless, even better, the author pays for immediate Gold OA). Nothing to do with ensuring OA, and as soon as possible. 1. No thank you. We want deposit to be done as soon as the paper is refereed and accepted, because (i) that is when the paper is ready to be used by researchers, (ii) many publishers do not embargo OA, and (iii) even if there is a publisher OA embargo and an author wishes to comply, the author can provide individual copies to individual users with the repository's request-copy-Button immediately upon deposit during the embargo -- as long as the final draft is deposited immediately upon acceptance. 2. No thank you. The acceptance date is clear and certain for all papers, and it is the earliest access point; the date of publication is later, sometimes much, much later, and its timing is variable and indeterminate (cover date often does not correspond to date the issue appears). And besides coming too late, the publisher's version of record has more (publisher) restrictions on it. 3. No thank you. We would rather retain control of providing Button-access, and then OA, to our own final drafts; and we can track the embargo for ourselves, thank you very much. 4. No thank you. Please send us your justification for asking research institutions and funders to justify to publishers when they require their researchers to deposit their final drafts: We are not talking about OA or embargoes here but about deposit. PA: "Following the publication of HEFCE’s statement of policy in March 2014 The Publishers Association and its members have been consulting with other stakeholders as to how best we in the publishing community can assist researchers and institutions to comply with the policy, particularly with regards to the deposit requirements. With regards (and all due respect), the deposit requirements have nothing to do with publishers (or with publisher embargoes on OA). PA: "In the course of these conversations it has become clear that this aspect of the policy is a source of widespread concern. Therefore I am writing to ask if HEFCE would give serious consideration to reviewing and revising certain elements of it." No doubt there is publisher concern about the deposit requirement: That concern is precisely because deposits (unlike OA embargoes) cannot be controlled by publishers. PA: "For us, the problematic section is Section 18 which states that “the output must have been deposited as soon after the point of acceptance as possible and no later than three months after this date (as given in the acceptance letter or email from the publications to the author)”. Section 19 then goes on to require that the output must have been deposited as the author’s accepted and final peer-reviewed text, which may later be updated by the version of record. Never mind the version of record. It's another matter. We're talking here about the author's final draft, and the time it is to be deposited. PA: "For the avoidance of doubt, The PA and members are of course in no way opposed to the principle of deposit per se; rather we are concerned with the timing and form of the mandatory deposit." Well, it's good to know that the PA are in no way opposed to something that is none of their business, and over which they have no control. But then why mention it at all? “We also wish to make the process of compliance as simple as possible for authors and HEIs and have received advice that the point of acceptance would be more suitable.” The PA’s response to the Consultation (October 2013) spoke to this point by saying “it is unclear where this advice has come from and what the justification for it is. To ensure compliance with embargo periods, which commence from the date of publication, it is logical to coincide the deposit or linking of papers with the publication date.”"
Is the PA owed a justification for a deposit policy that is none of its business and out of its control? And why are publisher embargoes even being mentioned in this context? Yes, publisher OA embargoes are timed from date of publication (which varies wildly from paper to paper). But the issue here is deposit -- not publisher OA embargoes or their timing. There is no link (logical or otherwise) between the deposit date, publication date, and embargo end-date. It would allow for the clearer management of embargo periods. Since these begin at the point of publication, deposit in institutional repository at this point removes the potential for any confusion arising between the availability of the accepted author manuscript and the version of record. Repositories will need to know the date of publication in order to respect the embargo period but they cannot know this from the date of acceptance." As stated, OA embargo periods are reckoned from the (variable) publication date, not from deposit date. They have nothing to do with deposit date. And OA is OA whether it is OA to the author's final draft or OA to the publisher's version of record (which has extra usage restrictions). The HEFCE/REF mandate is to deposit the final draft upon acceptance and to provide OA after the allowable embargo at the latest. No later version is stipulated. And the only version that is available until publication (and can hence be made OA or can be provided via the Button during an OA embargo) is the author's version. PA: "It would reduce the level of costs to HEIs, many of which have expressed concerns about the financial and administrative burden of ingesting author manuscripts in their repositories. We understand that for many institutions this will require a number of operations (for example, subsequent up-dating of data) to be performed manually which could be fulfilled automatically if deposit of the author manuscript is made upon publication. Not all HEIs have repositories capable of dealing with this requirement at present." It is terribly good of publishers to worry about institutions' operating expenses! There is a very useful way in which publishers could help lower these expenses: charge less for journals, or drop OA embargoes. But no help is needed with deposit, thank you very much. Authors are quite capable of depositing for themselves, as well as reckoning OA embargo intervals. PA: "Some stakeholders have made proposals for mitigating what we would see as the adverse effects of the proposed policy: for example encouraging publishers to provide author manuscripts and metadata in a standardised format through the Jisc “Publishers Router”. However, this would not address the central issue of the clear potential for confusion around the start date of the embargo period, which often will not be known at the point of acceptance. For many publishers, this proposed mitigation would imply an additional cost, which seems somewhat unreasonable to ask publishers to bear when we believe that deposit at the point of publication would eliminate these costs and concerns without compromising the policy’s goals to advance open access." To repeat: determining the date of publication and the date of the end of the embargo has nothing whatsoever to do with date of deposit. It is clear that from the publishers' point of view, the ideal outcome (if there is to be Green OA at all) is that it should be the publisher (who knows the date of publication, who owns the version of record, and who imposes the OA embargo) who controls the deposit, its timing, and the timing of the embargo. No, thank you. This is not about depositing as late as possible, and providing OA as late as possible, but about exactly the reverse. PA: "Ultimately we believe that any of these mitigating or alternative solutions are poor substitutes for amending the underlying policy requirement. It would greatly help our understanding of the HEFCE stance if you were able to share with us the justification for the policy – as referred to in last year’s consultation – and your perspective on the costs." Publishers have no right to ask institutions and funders for "justification" of deposit policies if the deposits are not OA. But if you want a general idea: it is to provide Open Access -- or at least Button access -- to refereed research as soon as the refereed final draft is ready. PA: "We would be grateful if you would give consideration to amending this aspect of open access policy. We believe it will act as a hindrance to the widespread take up of open access in the UK research community, whereas a requirement to deposit in an institutional repository on publication would be a policy which would command support from a much wider range of sector stakeholders." Good of publishers to be so concerned about compliance with the HEFCE deposit mandate, but, no, ceding control to publishers over deposit timing is not the way to ensure compliance. Making compliance a prerequisite for REF eligibility is. Happily, HEFCE was unfazed by this FUD. See how they have advised the Publishers Association (rather more diplomatically than I have put it above) that, no thanks, we will stay the course. A peer-reviewed journal article is either accessible to all of its potential users or it is not accessible to all of its potential users (but only to those at subscribing institutions). Open Access (OA) is intended to make articles accessible (online) to all their potential users, not just to subscribers, sothat all potential users can read, use, apply and build upon the findings, not just subscribers. Gratis OA means an article is accessible online to all its potential users. Libre OA means an article is accessible online to all its potential users and all users also have certain re-use rights, such as text-mining by machine, and re-publication. For individual researchers and for the general public the most important and urgent form of OA is Gratis OA. The reason Gratis OA is so important is that otherwise the research is inaccessible except to subscribers: OA maximizes research uptake, usage, applications, impact and progress. Gentil-Beccot, A., Mele, S., & Brooks, T. C. (2010). Citing and reading behaviours in high-energy physics: Scientometrics, 84(2), 345-355. The date when a peer-reviewed paper is ready to be made OA is the date when the final, peer-reviewed draft is accepted for pubication. Sometimes there can be delays of months between the date of acceptance and the date of publication of the pubisher’s version of record (VOR). And some (a minority) of publishers have imposed embargoes of up to 12 months from the date of publication before authors can make their articles OA. The delay from acceptance to publication, and the delay from publication till the end of any OA embargo all add up tp lost research access, uptake, usage, applications and progress. DOE and OSTI have been directed by OSTP to adopt a policy that ensures that OA is provided to federally funded research — by 12 months after the date of publication at the very latest. This is not a mandate to adopt a policy that ensures that OA is provided "at the very latest possible date." Yet that is what DOE has done — no doubt under the influence of the publishing industry lobby. The interests of research and researchers -- and hence of the public that funds the research -- are that the research should be made OA as soon as possible. The interests of (some of) the publishing industry are that it should be made OA as late as possible. The DOE has adopted a policy that serves the interests of the publishing industry rather than those of research, researchers and the tax-paying public. This is why DOE policy has been so warmly welcomed by the Association of American Publishers (AAP) as well as CHORUS (a publisher consortium expressly created to try to keep access-provision and the timing of compliance with open access mandates under the control of publishers rather than fundees and their institutions). The simplest remedy for this is not necessarily that the permissible OA embargo length needs to be reduced (though that would be extremely welcome and beneficial too!). Even within the constraints of a permissible OA embargo of 12 months at the very latest, there is a simple way to make the DOE policy much more powerful and effective, guaranteeing much more and earlier access. All that has to be done is to make immediate deposit of the author’s final, peer-reviewed draft, in the author’s institutional repository, mandatory immediately upon acceptance. Not just the metadata: the full final draft. If the author wishes to comply with a publisher OA embargo, the deposit need not be made OA immediately. Institutional repositories have an automated copy-request Button with which a user can request a single copy for research purposes, and the author can comply with the request, with just one click each. This is not OA, but it is almost-OA, and it is all that is needed to maximize research access, usage and progress during any permissible OA embargo. And besides maximizing access during any permissible OA embargo, requiring immediate institutional deposit also mobilizes institutions to monitor and ensure timely compliance with the funding agency’s requirement. The metadata for the deposit can be exported from each institutional repository to the DOE PAGES portal immediately, and then the portal, too (like google and google scholar), can immediately begin referring users back to the Button at the institution so the author can provide almost-OA with a single click until the end of any embargo. There is no need whatsoever to wait either for the publisher’s VOR, or for the end of the publisher’s embargo, or for Libre OA re-use rights: those can come when they come. But immediate institutional deposit needs to be mandated immediately. Otherwise the DOE is needlessly squandering months and months of potential research uptake, usage and progress for federally funded research. Please harmonize the DOE OA policy with the corresponding EU OA policy, as well as the HEFCE OA policy in the UK, the FRS OA policy in Belgium, and a growing number of institutional OA policies the world over. Ann Okerson (as interviewed by Richard Poynder) is committed to licensing. I am not sure whether the commitment is ideological or pragmatic, but it's clearly a lifelong ("asymptotic") commitment by now. I was surprised to see the direction Ann ultimately took because -- as I have admitted many times -- it was Ann who first opened my eyes to (what eventually came to be called) "Open Access." In the mid and late 80's I was still just in the thrall of the scholarly and scientific potential of the revolutionarily new online medium itself ("Scholarly Skywriting"), eager to get everything to be put online. It was Ann's work on the serials crisis that made me realize that it was not enough just to get it all online: it also had to be made accessible (online) to all of its potential users, toll-free -- not just to those whose institutions could afford the access-tolls (licenses). And even that much I came to understand, sluggishly, only after I had first realized that what set apart the writings in question was not that they were (as I had first naively dubbed them) "esoteric" (i.e., they had few users) but that they were peer-reviewed research journal articles, written by researchers solely for impact, not for income. But I don't think the differences between Ann and me can be set down to pragmatics vs. ideology. I too am far too often busy trying to free the growth of open access from the ideologues (publishing reformers, rights reformers (Ann's "open use" zealots), peer review reformers, freedom of information reformers) who are slowing the progress (from "now" to "better") of access to peer-reviewed journal articles by insisting only and immediately on what they believe is the "best." Like Ann, I, too, am all pragmatics (repository software, analyses of the OA impact advantage, mandates, analyses of mandate effeciveness). So Ann just seems to have a different sense of what can (hence should) be done, now, to maximize access, and how (as well as how fast). And after her initial, infectious inclination toward toll-free access (which I and others caught from her) she has apparently concluded that what is needed is to modify the terms of the tolls (i.e., licensing). This is well-illustrated by Ann's view on SCOAP3: "All it takes is for libraries to agree that what they’ve now paid as subscription fees for those journals will be paid instead to CERN, who will in turn pay to the publishers as subsidy for APCs." I must alas disagree with this view, on entirely pragmatic -- indeed logical -- grounds: the transition from annual institutional subscription fees to annual consortial OA publication fees is an incoherent, unscalable, unsustainable Escherian scheme that contains the seeds of its own dissolution, rather than a pragmatic means of reaching a stable "asymptote": Worldwide, across all disciplines, there are P institutions, Q journals, and R authors, publishing S articles per year. The only relevant item is the article. The annual consortial licensing model -- reminiscent of the Big Deal -- is tantamount to a global oligopoly and does not scale (beyond CERN!). And there are plenty of pragmatic reasons why the librarian-obsession -- perhaps not ideological, but something along the same lines -- with the Version-of-Record is misplaced when it comes to access to journal articles: The author's final, peer-reviewed, accepted draft means the difference between night and day for would-be users whose institutions cannot afford toll-access to the publisher's proprietary VoR. And for the time being the toll-access VoR is safe [modulo the general digital-preservation problem, which is not an OA problem], while subscription licenses are being paid by those who can afford them. CHORUS and SHARE have plenty of pragmatic advantages for publishers (and ideological ones for librarians), but they are vastly outweighed by their practical disadvantages for research and researchers -- of which the biggest is that they leave access-provision in the hands of publishers (and their licensing conditions). About the Marie-Antoinette option for the developing world -- R4L -- the less said, the better. The pragmatics really boil down to time: the access needs of both the developing and the developed world are pressing. Partial and makeshift solutions are better than nothing, now. But it's been "now" for an awfully long time; and time is not an ideological but a pragmatic matter; so is lost research usage and impact. Ann says: "Here’s the fondest hope of the pragmatic OA advocate: that we settle on a series of business practices that truly make the greatest possible collection of high-value material accessible to the broadest possible audience at the lowest possible cost — not just lowest cost to end users, but lowest cost to all of us." Here's a slight variant, by another pragmatic OA advocate: "that we settle on a series of research community policies that truly make the greatest possible collection of peer-reviewed journal articles accessible online free for all users, to the practical benefit of all of us." The online medium has made this practically possible. The publishing industry -- pragmatists rather than ideologists -- will adapt to this new practical reality. Necessity is the Mother of Invention. Let me close by suggesting that perhaps something Richard Poynder wrote is not quite correct either: He wrote "It was [the] affordability problem that created the accessibility problem that OA was intended to solve." No, it was the creation of the online medium that made OA not only practically feasible (and optimal) for research and researchers, but inevitable. (See the opening words of the Budapest Open Access Initiative.) But Richard is probably right that it was affordability that (eventually) roused librarians -- first to consortial licensing, and then to OA. WOJICK: "The US Government is developing a green OA system for all articles based even in part on Federal funding, with a default embargo period of 12 months. The publishers have responded with a proposal called CHORUS that meets that requirement by taking users to the publisher's website. Many of the journals involved presently have no OA aspect so this will significantly increase the percentage of OA articles when it is implemented over the next few years." Let us fervently hope that the US Government/OSTP will not be taken in by this publisher Trojan Horse called "CHORUS." It is a tripping point, not a tipping point. If not, we can all tip our hats goodbye to Open Access -- which means free online access immediately upon publication, not access after a one-year embargo. CHORUS is just the latest successor organisation for self-serving anti-Open Access (OA) lobbying by the publishing industry. Previous incarnations have been the "PRISM coalition" and the "Research Works Act." 1. It is by now evident to everyone that OA is inevitable, because it is optimal for research, researchers, research institutions, the vast R&D industry, students, teachers, journalists and the tax-paying public that funds the research. 2. Research is funded by the public and conducted by researchers and their institutions for the sake of research progress, productivity and applications -- not in order to guarantee publishers' current revenue streams and modus operandi: Research publishing is a service industry and must adapt to the revolutionary new potential that the online era has opened up for research, not vice versa! 3. That is why both research funders (like NIH) and research institutions (like Harvard) -- in the US as well as in the rest of the world -- are increasingly mandating (requiring) OA: See ROARMAP. 4. Publishers are already trying to delay the potential benefits of OA to research progress by imposing embargoes of 6-12 months or more on research access that can and should be immediate in the online era. 5. The strategy of CHORUS is to try to take the power to provide OA out of the hands of researchers so that publishers gain control over both the timetable and the insfrastructure for providing OA. 6. And, without any sense of the irony, the publisher lobby (which already consumes so much of the scarce funds available for research) is attempting to do this under the pretext of saving "precious research funds" for research! 7. It is for researchers to provide OA, and for their funders and institutions to mandate and monitor OA provision by requiring deposit in their institutional repositories -- which already exist, for multiple purposes. 8. Depositing in repositories entails no extra research expense for research, just a few extra keystrokes, from researchers. 9. Institutional and subject repositories keep both the timetable and the insfrastructure for providing OA where it belongs: in the hands of the research community, in whose interests it is to provide OA. 10. The publishing industry's previous ploys -- PRISM and the Research Works Act -- were obviously self-serving Trojan Horses, promoting the publishing industry's interests disguised as the interests of research. Let the the US Government not be taken in this time either. Giles, J. (2007) PR's 'pit bull' takes on open access. Nature 5 January 2007. WOJICK: "NIH uses a 12 month embargo and that is what the other Federal agencies are required to do, unless they can justify a longer or shorter period for certain disciplines. This has nothing to do with the publishers or CHORUS. The publishers are building CHORUS so that the agencies will use the publisher's websites and articles instead of a redundant repository like NIH uses. They are merely agreeing to the US Governments requirements, while trying to keep their users, so there is no Trojan horse here, just common sense. Immediate access is not an option in this Federal OA program. The OA community should be happy to get green OA." 2. The Trojan Horse would be funding agencies foolishly accepting publishers' "CHORUS" invitation to outsource author self-archiving -- and hence compliance with the funder mandate -- to publishers, instead of having fundees do it themselves, in their own institutional repositories. 3. To repeat: Delayed Access is not Open Access -- any more than Paid Access is Open Access. Open Access is immediate, permanent online access, toll-free, for all. 4. Delayed (embargoed) Access is publishers' attempt to hold research access hostage to their current revenue streams, forcibly co-bundled with obsolete products and services, and their costs, for as long as possible. All the research community needs from publishers in the OA era is peer review. Researchers can and will do access-provision and archiving for themselves, in their own institutional OA repositories, at next to no cost. And peer review alone costs only a fraction of what institutions are paying publishers now for subscriptions. WOJICK: "if delayed access is not open access in your view then why did you post the tipping point study, since it includes delayed access of up to 5 years? Most people consider delayed (green) access to be a paradigm of open access. That is how the term is used. You are apparently making your own language." But OA advocates can live with the allowable funder mandate embargoes for the time being -- as long as deposit is mandated to be done immediately upon acceptance for publication, by the author, in the author's institutional repository, and not a year later, by the publisher, on the publisher's own website. Access to the author's deposit can be set as Closed Access during the allowable embargo period, but meanwhile authors can provide Almost-OA via their repository's facilitated Eprint Request Button. WOJICK: "I think what the US Government is actually doing is far more important as an OA tipping point." Yes, the US funder mandates are extremely important, even if they still need a tweak (as noted). But no, Delayed Access is definitely not OA, let alone Green OA, although that is how publishers would dearly love to define OA, and especially Green OA. WOJICK: "As for your Trojan horse point (#2) there is no author archiving with CHORUS." Yes, that's the point: CHORUS is trying to take author self-archiving out of the hands and off the sites of the researchers and their institutions, to put it in the hands and on the site of publishers. That is abundantly clear. And my point was about how bad that was, and why: a Trojan Horse for the research community and for the future of OA. But the verb should be CHORUS "would be," not CHORUS "is" -- because, thankfully, it is not yet true that this 4th publishers' Trojan Horse has been allowed in at all. WOJICK: "The author merely specifies the funder from a menu during the journal submission process and the publisher does the rest. Thus there is no burden on the authors and no redundant repository. The article is openly available from the publisher after the Federally specified embargo period. This is extremely efficient compared to the old NIH repository model." Indeed it would be, and would put publishers back in full control of the future of OA. Fortunately, the CHORUS deal is far from a fait accompli, and the hope (of OA advocates and the concerned research community) is that it never will be. The only thing the "old NH repository model" (PubMed Central, PMC) needs is an upgrade to immediate institutional deposit, followed by automatic harvesting and import (after the allowable embargo has elapsed) by PMC or any other institution-external subject-based harvester. With that, the OSTP mandate model would be optimal (for the time being). WOJICK: "This is not about author self archiving, which is a separate issue, so I see no Trojan horse." 1. The "This" is US federal funding agency Open Access mandates. 2. The "self" is the author, who is also the fundee, the one who is bound to comply with the conditions of the funder mandate. 4. The "Trojan Horse" is the attempt by publishers to take this out of the hands of the author/fundee/mandatee and put it into the hands of the publisher, who is not the fundee, not bound by the mandate, and indeed has a conflict of interest with making papers free for all on the Web. 5. On no account should the compliance with the funder mandate be outsourced and entrusted to a 3rd party that is not only not bound by the mandate, but in a conflict of interest with it. WOJICK: "It is about the design of the Federal program, where I see no reason for redundant Federal archiving." PubMed Central (PMC) is a very valuable and widely used central search tool. Its usefulness is based on both its scope of coverage (thanks to mandates) and on its metadata quality. It borders on absurdity for publishers to criticize this highly useful and widely used resource as "redundant." It provides access where publishers do not. WOJICK: "There is nothing in the CHORUS approach to the Federal program design that precludes author self archiving in institutional repositories as a separate activity." If authors self-archived of their own accord, "as a separate activity," there would have been no need for federal Open Access mandates. The federal mandates do not require fundees to provide toll-free access only after a year after publication: They require them to provide toll-free access within a year at the latest. Publishers have every incentive to make (and keep) this the latest, by taking self-archiving out of authors' hands and doing it instead of them, as late as possible. Moreover, funder OA mandates are increasingly being complemented by institutional OA mandates, which cover both funded and unfunded research. This is also why institutions have institutional repositories (archives), in which their researchers can deposit, and from which central repositories can harvest. This is also the way to tide over research needs during OA embargoes, with the help of institutional repositories' immediate Almost-OA Button. And again, no need here for advice from publishers, with their conflicts of interest, on how institutions can save money on their "redundant archives" by letting publishers provide the OA in place of their researchers (safely out of the reach of institutional repositories' immediate Almost-OA Button). WOJICK: "The journals are part of the research community and they have always been the principal archive." Journals consist of authors, referees, editors and publishers. Publishers are not part of the research community (not even university or learned-society publishers); they earn their revenues from it. Until the online era, the "principal archive" has been the university library. In the online era it's the web. The publisher's sector of the web is proprietary and toll-based. The research community's sector is Open Access. And that's another reason CHORUS is a Trojan Horse. WOJICK: "With CHORUS they will be again." What on earth does this mean? That articles in the publishers' proprietary sector will be opened up after a year? That sounds like an excellent way to ensure that they won't ever be opened up any earlier, and that mandates will be powerless to make them open up any earlier. WOJICK: "After all the entire process is based on the article being published in the journal." Yes, but what is at issue now is not publishing but access: when, where and how? WOJICK: "It is true that this is all future tense including the Federal program, but the design principles are here and now." And what is at issue here is the need to alert the Federal program that it should on no account be taken in by CHORUS's offer to "let us do the self-archiving for you." WOJICK: "I repeat, immediate access is not a design alternative. The OSTP guidance is clear about that. So most of your points are simply irrelevant to the present situation." The federal mandates do not require fundees to provide toll-free access only 12 months after publication: They require them to provide toll-free access 12 months at the latest. Immediate OA (as well as immediate-deposit plus immediate Almost-OA via the Button) is definitely an alternative -- as well as a design alternative. But not if OSTP heeds the siren call of CHORUS. WOJICK: "There is no funder mandate on authors at this point, so you are assuming a burdensome model that need not be implemented." Right now, there is a presidential (OSTP) directive to US federal funding agencies to mandate (Green) OA. It is each funding agency that will accordingly design and implement its own Green OA mandate, as the NIH did several years ago. WOJICK: "The mandate (requirement) will, as always, be on the fundees: the authors of the articles that are to be made OA, as a condition of funding." The only mandate is on the Federal funding agencies to provide public access to funder-related articles within 12 months of publication. The presidential (OSTP) directive is to the US federal funding agencies to mandate (Green) OA, meaning that all published articles resulting from the research funded by each agency must be made OA -- within 12 months of publication at the latest. The articles are by fundees. The ones bound by the mandates are the fundees. Fundees are the ones who must make their research OA, as a condition of funding. WOJICK: "CHORUS does this in a highly efficient manner, rendering an author mandate unnecessary." CHORUS does nothing. It is simply a proposal by publishers to funding agencies. And to suggest that the the reason funding agencies should welcome the CHORUS proposal is efficiency is patent nonsense. To comply with their funder's requirements, fundees must specify which articles result from the funding. The few fundee keystrokes for specifying that are exactly the same few fundee keystrokes for self-archiving the article in the OA repository. No gain in efficiency for funders or fundees in allowing publishers to host and time the OA: just a ruse to allow publishers to retain control over the time and place of providing OA. Because of the monumental conflict of interest -- between publishers trying to protect their current revenue streams and the research community trying to make its findings accessible as soon and as widely as possible -- control over the time and place of providing OA should on no account be surrendered by funders and fundees to publishers. WOJICK: "Search is no problem as there are already many ways to search the journals." And there are also already many ways to search OA articles on the web or in repositories. So, correct: Search is no problem, and not an issue. In fact, it's a red herring. What is really at issue is: in whose hands should control over the time and place of providing OA be? Answer: Findees, their institutions and their funders; not publishers. WOJICK: "DOE PAGES, described in the first article I listed in my original post, is a model of an agency portal that is being designed to use CHORUS. It will provide agency-based search as well. CHORUS as well will provide bibliographic search capability." To repeat: The same functionality (and potentially much more and better functionality) is available outside the control of publishers too, via the web, institutional repositories, harvesters, indexers and search engines. The only thing still missing is the OA content. And that's what publishers are trying to hold back as long as possible, and to keep in their own hands. WOJICK: "We simply do not need a new bunch of expensive redundant repositories like PMC." And the research community simply does not need to cede control over the locus and timetable of providing OA to publishers. WOJICK: "I am also beginning to wonder about your Trojan horse metaphor. 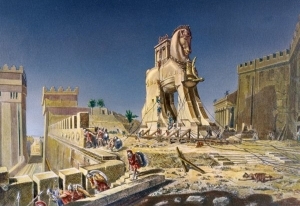 The Trojan horse is a form of deception, but there is no deception here, just a logical response to a Federal requirement, one that keeps a journal's users using the journal. The publishers are highly motivated to make CHORUS work." CHORUS is all deception (and perhaps self-deception too, if publishers actually believe the nonsense about "efficiency" and "expense"), and the "logic" is that of serving publishers' interests, not the interests of research and researchers. The simple truth is that the research community (researchers and their institutions) are perfectly capable of providing Green OA for themselves, cheaply and efficiently, in their own institutional OA repositories and central harvesters -- and that this is the best way for them to retain control over the time and place of providing OA, thereby ensuring that 100% immediate OA is reached worldwide as soon as possible. Letting in the publishers' latest Trojan Horse, CHORUS, under the guise of increasing efficiency and reducing expense, would in reality be letting publishers maximize Delayed Access and fend off universal Green OA in favor of over-priced, double-paid (and, if hybrid, double-dipped) Fools Gold OA, thereby locking in publishers' current inflated revenue streams and inefficient modus operandi for a long time to come, and embargoing OA itself, instead of making publishing -- a service industry -- evolve and adapt naturally to what is optimal for research in the online era. "Under CHORUS the lead author merely has to check a box indicating the funder. The institutions have to do nothing more, nor does the fundee. The journal then gives the article link to the agency and makes the article publicly available at the agency controlled time. This is enormously simpler than creating repositories that fundees have to populate and funders have to work with (and someone has to build and maintain). In essence the article is published and the agency links to it. That is all and it cannot be any simpler than this. 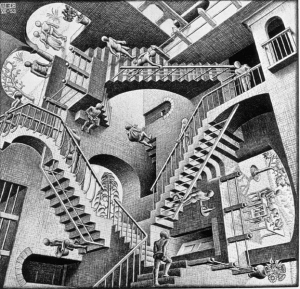 Creating a parallel universe of redundant repositories must be more complex, costly and burdensome." As far as I know, the publishers' CHORUS deal that you describe (and that I have referred to in my not-so-private language argument as a Trojan Horse) has not yet been accepted by the Federal Government, nor by its funding agencies. Maybe they will accept it, maybe they won't. I and many others have been describing the many reasons they should not accept it. You are repeating arguments about the redundancy and complexity and costliness of repositories to which I and many others have already replied. But I am not trying to persuade you that researchers using their keystrokes to deposit in OA repositories is better for research and for OA than letting publishers do it for them: The ones I and many others are trying to persuade of that are the same ones that you and the rest of the publisher lobby are trying to persuade of the opposite: the Federal government and its research funding agencies. May the best outcome (for the research community) win. The Government directive is not to make funded research freely accessible 12 months after publication but within 12 months of publication. 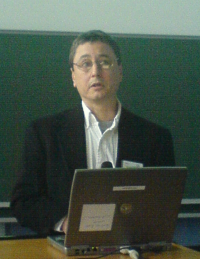 The publishers' Trojan Horse would not only take mandate compliance out of the hands of fundees, making compliance depend on publishers rather than fundees, but it would also ensure that the research would not be made freely accessible one minute before the full 12 months had elapsed. If I were a publisher, interested only in protecting my current income streams, come what may, I'd certainly lobby for that, just as I would lobby for untrammelled cigarette ads and zones, if I were a tobacco company, interested only in protecting my current income streams, come what may; or for the untrammelled manufacture and use of plastic bags, if I were a plastic bag company with similar "community" interests. CHORUS is a terrific way of locking in publisher embargoes and Delayed Access for years and years to come, thereby leaving payment for Fools Gold as the sole option for providing immediate OA. WOJICK: "What Federal system design arguments have I not responded to?" 2. that OA mandates are intended to require authors to provide OA whereas CHORUS would take it out of authors' hands entirely (thereby mooting mandate compliance altogether, let alone earlier compliance or wider compliance, for unfunded and un-mandated research). WOJICK: "It is not an ad hominem to point out that the Federal policy is not anti-publisher, as many OA advocates are." I for one am not anti-publisher. But I'm very definitely against publisher anti-OA-mandate lobbying and I'm also against publisher embargoes on Green OA. Apart from that, I have a long history of defending publishers against overzealous OA advocates or overpricing plainants -- as long as the publisher was on the "side of the angels," by endorsing immediate, unembargoed Green, as Springer and Elsevier did for many years. The gloves came off when publishers started trying to renege on their prior endorsements of immediate Green. WOJICK: "It is an important fact about the policy. I have to be repetitive because Harnad is presenting the same non-design arguments over and over." I have no idea what you mean by "non-design" arguments. The points above are against CHORUS as a means of implementing the funding agencies' Green OA mandate, that's all. WOJICK: "Arguments such as that publishers cannot be trusted..."
I have not said that. I said that compliance with funders' mandates on fundees to provide OA to their funded research should on no account be entrusted to publishers because of the obvious conflict of interest: The interest of research and researchers is that research should be OA immediately; the interest of publishers is that access should be delayed for as long as possible (12 months, within the "design" of the OSTP directive). WOJICK: "[Arguments such as that] access should be immediate via institutional repositories…"
I don't just repeat that over and over: I give the reasons why: Because Open Access means Open Access, and the reasons that make Open Access important at all make it important immediately upon publication, not 12 months later. And it's institutional repositories because institutions are the providers of all research, funded and unfunded, in every discipline. Institutions have already created OA repositories. They have many reasons for wanting to archive, manage and publicly showcase their own research output in their own repositories -- over and above the reasons for OA itself (which are: maximizing research uptake, usage, applications, impact and progress). And if the author wishes to comply with a publisher embargo, access to the deposit can be set as Closed Access instead of Open Access during the embargo, in which case the repository's eprint-request Button can provide Almost-OA during the embargo (while embargoes last -- which will not be long, one hopes, once mandatory Green OA has become universal). All of these benefits are lost if publishers are in control of providing public access on their sites, a year after publication. WOJICK: "[Arguments such as that] delayed access is not open access, etc. My response does not vary." Delayed access means losing a year of Open Access. Your response does not vary because the publisher lobby is interested in minimizing, not maximizing Open Access. If the maximal allowable delay is 12 months, publishers will happily make sure it is not a minute less than 12 months, and on their site, with no Almost-OA Button to tide over the embargo, no integration with institutional mandates, and authors entirely out of the compliance loop for mandates that are intended to generate as much OA as possible, as soon as possible. My own response varies as much as possible, in an effort -- with each new iteration -- to present from every angle the case for implementing OA mandates in such a way as to provide the maximum benefit to research and researchers, rather than just to protect the proprietary interests of publishers at the expense of research, researchers, and the public that funds them. WOJICK: "I have already responded to these points. The publisher's self interested motivation is to keep the web traffic to its journals." WOJICK: "Studies suggest [publishers] are losing 20% to PMC." And while publishers' download sites have lost the traffic, research has gained a great deal of functionality, as well as OA. Those who consider it in terms of the interests of the research community see this outcome as perfectly natural and welcome, given the power and potential of the online era. WOJICK: "The publishers believe this, whether it is true or not, thus their motivation." Their motivation is in no doubt. But the issue is not what is best for publishers but what is best for research, researchers and the public that funds them. WOJICK: "The mandate is that the articles be made publicly accessible and the articles are the publisher's so they are not third party contractors, whatever that might mean." My articles are my publisher's, not mine? I think you might mean that the publishers are the holders of the copyright, or exclusive vending rights. Well we're talking about a mandate here -- by the party of the second part, the author's funder, requiring the party of the first part, the author, to make the research they've funded publicly accessible within a year of publication at the very latest. That's a condition of a contract the author must sign before ever doing the research, let alone signing any subsequent contract with any party of the third part regarding vending rights. WOJICK: "The fundees need play no role." The fundees play no role? No role in what? The funder mandates bind the fundees, not some other party. WOJICK: "The publishers are making a ground breaking concession by agreeing to the Federal embargo deadlines." Agreeing? It seems to me they don't have much choice! Who are publishers conceding to? And conceding what? WOJICK: "This is great news for OA. I have no idea what you mean by letting them sit. They will be on view in their on-line journals, which is arguably where they belong." Ceding the provision of public access to the publisher's site and the publisher's timetable means that research articles must sit for 12 months, accessible only to subscribers, even though the mandate states that they must be made publicly accessible within 12 months at the latest. Fundees could have deposited them in repositories immediately, and made them publicly accessible earlier, or, if they wished to comply with a publishers embargo, made them immediately Almost-OA, via the repository's Button, instead of sitting inaccessibly for 12 months. And before you reply "fundees can still do that if they want to," let me remind you of the fundamental purpose of Green OA mandates: It's to get authors to provide OA. Un-mandated, they don't. Not because they don't want to. But because without a mandate from their funders or institutions, they dare not: because of fear of their publishers. The mandate releases authors from that fear. And the CHORUS variant -- in which "the fundee has no role" -- would leave authors stuck in that fear, contractually unprotected by a funder mandate, and that would render the funder policy empty and ineffectual beyond its absolutely minimum requirement, which is public access after 12 months (but not a moment before). And that would of course suit publishers just fine. In fact, maybe that's the reason for their newfound magnanimity: "Concede" on public access after a 12-month embargo, take control of hosting and providing access, and maybe that pesky global clamor for immediate OA will go away -- or, better, maybe it will just redirect authors toward the Fools-Gold counter where they can pay hybrid publishers for immediate OA. WOJICK: "The repository approach made sense when the publishers refused to provide access. That day has passed." Don't bank on it. The clamor for access is growing and growing. And that's immediate Open Access, not publisher-Delayed Access after 12 months. 1. Potential CHORUS Catastrophe for OA: Peter's summary of OA setbacks mentions only Finch. Finch was indeed a fiasco, with the publishing lobby convincing the UK to mandate, pay for, and prefer Gold OA (including hybrid Gold OA), and to downgrade and ignore Green OA. CHORUS is an attempt by the publishing lobby to take compliance with Green OA mandates out of the hands of the fundees whom OA mandates are designed to require to provide OA, and instead transfer control over the execution, the locus and the timetable for mandate compliance into the hands of publishers. Adopting CHORUS would mean that President Obama's OSTP directive -- requiring that federally funded research must be made freely accessible online within 12 months of publication -- would instead ensure that it was made freely accessible after 12 months, and not one minute earlier;. With CHORUS, publishers would have succeeded in locking in 12-month-embargoed Delayed Access instead of immediate Green OA for years to come, in the US and, inevitably, also worldwide. So, as I am sure Peter will agree, CHORUS must be rejected at all costs, just as the previous Trojan Horses of the publishing lobby -- PRISM and the Research Works Act -- were rejected. It's bad enough that Finch slipped through. Even if the publiser gives subscribing institutions a rebate to offset double-dipping, Hybrid Gold locks in current total publisher revenue -- from institutional subscription fees plus author hybrid Gold OA fees -- come what may. Hybrid Gold immunizes publishers from any pressure to cut costs by phasing out obsolete products and services in the online era. Only globally mandated Green OA self-archiving in repositories by authors can force publishers to downsize to the post-Green essentials alone. And if a hybrid Gold journal also imposes an embargo on Green, that is tantamount to legally sanctioned extortion, even without double-dipping: "If you want to provide immediate OA, you must pay me even more than I am already being paid by your institution for subscriptions -- and your institution only gets back a tiny fraction of the rebate from your surcharge." 3. Pre-Green Fools Gold vs. Post-Green Fair Gold: The only thing that can bring the cost of peer-reviewed journal publishing down to a fair, affordable, sustainable price is globally mandated Green OA. Only Green OA will allow institutions to cancel their journal subscriptions, thereby forcing journals to adapt naturally to the online era by cutting obsolete costs, downsizing and converting to Fair Gold. Once Green OA mandates fill them, it is the global network of Green OA repositories that will allow publishers to phase out all the products and services associated with access-provision and archiving. CHORUS and Finch are designed to allow publishers to keep co-bundling (and charging) for their obsolete products and services as long as possible. Bravo to Danny Kingsley for her invaluable antipodean OA advocacy! 1. The publishing industry is using Green OA embargoes and lobbying to try to hold OA hostage to its current inflated revenue streams as long as possible-- by forcing the research community to pay for over-priced, double-paid (and double-dipped, if hybrid) Fools Gold if it wants to have OA at all. It's time for the research community to stop stating that it will stop mandating and providing Green OA if there's ever any evidence that it will cause subscription cancelations. Of course Green OA will cause cancelations, eventually; and so it should. Green OA will not only provide 100% OA but it will also force publishers to phase out obsolete products and services and their costs, by offloading all access-provision and archiving onto the worldwide nework of Green OA repositories. Once subscriptions are made unsustainable by mandatory Green OA, journals will downsize and convert to post-Green Fair-Gold, in place of today's over-priced, double-paid (and double-dipped, if hybrid) Fools-Gold. 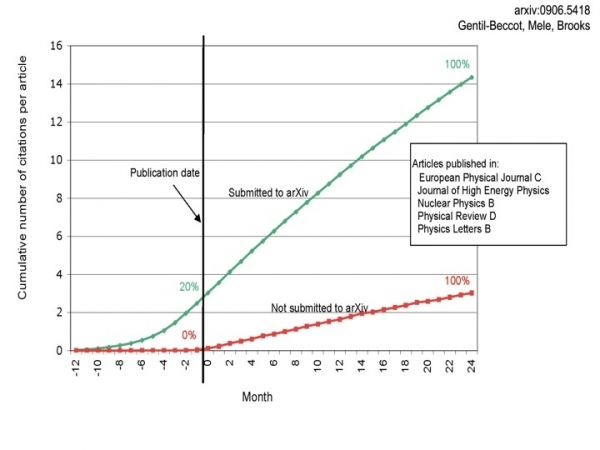 Green OA embargoes have one purpose, and one purpose only: to delay this optimal, inevitable, natural and obvious outcome for as long as possible. Research is not funded, conducted, peer-reviewed and made public in order to provide or guarantee revenues for the publishing industry, but to be used, applied and built upon, to the benefit of the public that funds it. Globally mandated Green OA will not only provide OA, but it will also force publishers to cut obsolete costs and downsize to just managing peer review. All access-provision and archiving will be done by the worldwide network of Green OA Institutional Repositories. It's in order to delay that outcome that publishers are using every means at their disposal -- embargoing Green OA and lobbying against Green OA mandates with PRISM, the Research Works Act, the Finch Report and CHORUS -- to fend off Green OA as long as possible and force the research community instead toward over-priced, double-paid (and, if hybrid, double-dipped) Fools Gold if they want to have any form of OA at all. (iii) designate repository deposit as the sole mechanism for submitting publictions for institutional performance review (or national research assessment). 3. The research community should resolutely resist publishers' attempt to imply that "Green OA" means "Delayed (embargoed) OA." It does not. OA means immediate, unembargoed access. It is publishers who are trying to impose embargoes, in order to delay OA and preserve their current inflated revenue streams for as long as possible, forcing authors to pay for grotesquely overpriced Fools Gold if they want immediate OA. The immediate-deposit mandate (with the Button) immunizes against those tactics. 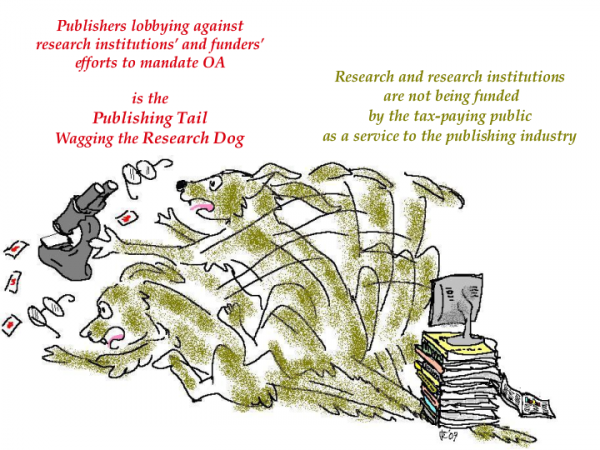 "Delaying OA" is publishers' objective, against the interests of research, researchers, their universities, their funders, the vast R&D industry, students, teachers, the developing world, journalists, and especially the general public who is funding the research. Immediate-deposits mandates are the way for the research community to ensure that the interests of research. Otherwise (I have said many times), it is the publishing tail continuing to wag the research dog. 4. OA Metrics will follow, not precede OA. The reason we do not have 100% OA yet is not because of bias against Gold OA journals. It is because of researcher passivity, publisher activism (embargoes and lobbying) and lack of clear information and understanding about OA and how to make it happen. It is normal and natural that journals' quality and importance should be based on their prior track-record for quality and importance (rather than their cost-recovery model). New journals (whether OA or non-OA) first need to establish a track record for quality and importance. Besides the journal's track record and citation impact, however, we also have citation counts for individual authors and articles, and we are slowly also developing download counts and other metrics of research usage and impact. There will be many more OA metrics too -- but for that to happen, the articles themselves need to be made OA! And that is why mandating Green OA is the priority. MT: "Immeasurable confusion has resulted from people proposing alternative [definitions of OA] – either through ignorance or malice." But the original BOAI definition of OA was elaborated into two components or degrees -- not contradicted -- by Peter Suber and myself: free online access (Gratis OA) and free online access plus various re-use rights (Libre OA). Gratis OA is urgent, all research and researchers need it, and it's fully within reach (of mandates) already; Libre OA is not urgent, not all research and researchers need it, and it's not fully within reach already. MT: "Green articles in the RCUK sense can be encumbered by non-commercial clauses, stripping them of much of their value to the taxpayer, and can be delayed by embargoes of up to two years… So in the context of RCUK specifically, Green is virtually useless, and the only way to obtain actual open access is by paying for Gold. Which I don’t doubt is exactly what the publishers wanted. It's to RCUK's eternal shame that they rolled over and allowed this, after having made such a strong opening statement." The term "non-commercial clauses" here refers to Libre OA re-use rights. Green OA embargoes were ratcheted up by publishers because Finch/RCUK kept treating Green as if it were "Delayed OA" and because of Finch/RCUK's readiness to pay pre-emptively for Libre Gold OA. Green Gratis OA (free online access) is certainly not "virtually useless," and embargoes can be surmounted by the institutional repository's facilitated eprint request Button. But this is the way Libre Gold advocates delay and complicate the progress of Gratis Green OA. MT: "[W]e have to end to the childish notion that the value of a piece of research is dependent on what journal publishes it." Yes. But what it does depend on is the quality standards and track-record of the journal that publishes it. MT: "I do hope this year will see a decision made on how to implement the White House OSTP's OA recommendation, and I hope that it will elect to do this by expanding its own PubMed Central system rather than by acquiescing to land-grab attempts by either publishers (CHORUS) or libraries (SHARE)." I hope OSTP will not elect to mandate direct deposit in institution-external repositories but will instead mandate institutional deposit (followed by automated institution-external harvesting, inporting or exporting, where desired). This will minimize publisher inteference (with embargoes and other constraints), engage institutions in monitoring and ensuring timely compliance with the mandate, and give institutions the incentive to adopt mandates of their own, for their non-funded output. CHORUS should certainly be rejected, and library SHARE only accepted if it's to make institutional OA repositories more interoperable, not to allow publishers to assume the function of Green OA access-provision or archiving. MT: "[Through Gold OA] we'll be able to save more than nine tenths of what we're spending now." True, but this will not happen through pre-emptive pre-Green Fools-Gold, only through post-Green Fair-Gold. "OA is cheaper, but that's not why it matters. What counts is not that it has lower cost, but that it has higher value." OA does not have lower or higher cost. OA (Open Access) is about access. What will have lower cost is post-Green Fair-Gold OA. But the real value of OA is in the access: OA maximizes research uptake, usage, applications, impact, productivity and progress, to the benefit fo research, researchers, their institutions, their funders, the R&D industry, teachers, students, journalists, and the tax-paying public that funds the research. The OSTP should on no account be taken in by the Trojan Horse that is being offered by the research publishing industry's "CHORUS." Let the OSTP not be taken in this time either. Below, Kate Price of U. Surrey asks whether publishers would allow authors to make electronic versions of their articles available to the UK's assessors for its 4-yearly Research Assessment Exercise (RAE) (in place of the paper submissions that had been required in prior years). Alicia Wise of the Publishers Licensing Society replies that licensing arrangements are being made with HEFCE. First, I would like to point out such a colossal absurdity in this that it takes one's breath away. Then, more constructively, I will point out what is likely to be the actual outcome, mooting the entire question. (1) The Absurdity: If for RAE 1996 and 2001 there was no need felt to make a "licensing arrangement" in order for authors to submit paper copies of their published articles for RAE assessment, why on earth would anyone imagine that a licensing arrangement is required for the electronic versions? I am not in the habit of asking my publisher for permission to send copies of my own article for evaluation, whether for RAE, salary review, or research grant funding. (What on earth were HEFCE thinking?). (2) The Constructive Alternative: Research Councils UK (RCUK) is, one hopes, on the verge of mandating that the final, peer-reviewed, accepted draft ("postprint") of all articles resulting from RCUK funding must be deposited in the fundee's institutional repository immediately upon acceptance for publication. UK Universities are also poised to follow suit, with mandatory depositing of all their research output. The solution is hence crystal clear. Forget about licensing! The postprints should be used for RAE assessment. The PDFs are infinitely more trouble than they are worth: their marginal value over the postprint is next to nothing. HEFCE should join the chorus (of research funding councils and research institutions themselves) in mandating that all postprints be deposited in the university's IR. Deposit mandates are wonderful things, for they cater for all tastes. Ninety-three percent of journals have already agreed that access to them can be set to Open Access (OA). (Note, again, that no permission is needed from anyone in order to deposit the postprints themselves!) The journal's endorsement of the author's making the deposit OA is welcome, but not necessary either. But if an author for some reason prefers not to make the deposited article OA, they can make it RA (restricted access) instead. The RAE assessors can then be given access to the RA deposit. Now, before everyone starts squawking about all sorts of legalistic and pedantic niceties, sit and think about it for a few moments, and try to sort out what really has substance in all this, and what is just officious fluff: No, the difference between PDF and postscript is not a problem. No, providing access to RAE assessors for a restricted access deposit is not a problem. No, mandating deposit is not a problem. In fact all of these are natural developments, optimal for research, researchers, their institutions, their funders and their assessors -- and they are also inevitable. So we can either keep talking ourselves through more epicycles, or we can just go ahead and do the optimal and inevitable (and obvious) at last. Harnad, S., Carr, L., Brody, T. & Oppenheim, C. (2003) Mandated online RAE CVs Linked to University Eprint Archives: Improving the UK Research Assessment Exercise whilst making it cheaper and easier. Ariadne 35 (April 2003). "This is really a question for any publishers scanning this list, but UK HE librarians will be interested in the answers. The UK Research Assessment Exercise will occur again in 2008... I'm concerned about... published journal articles, published conference proceedings and published books (and individual book chapters). "Has the Higher Education Funding Council for England made any approaches to publishers regarding allowing electronic access to published materials specifically for the RAE? "What are publishers' opinions on the copyright implications of this (given that this access would be for a limited period, to a very limited audience, and crucial for the main business of a UK university). Are publishers likely to object strongly?" "My name is Alicia Wise, and I work for an organisation called the Publishers Licensing Society. Graham Taylor at the Publishers Association kindly forwarded your email to me. "HEFCE and PLS are actively working on a licence so that RAE panels can access published works for their review purposes. The licence would cover printed and digital copies. I'd be happy to update you on progress, or you could speak with Ed Hughes who is the RAE Manager at HEFCE.